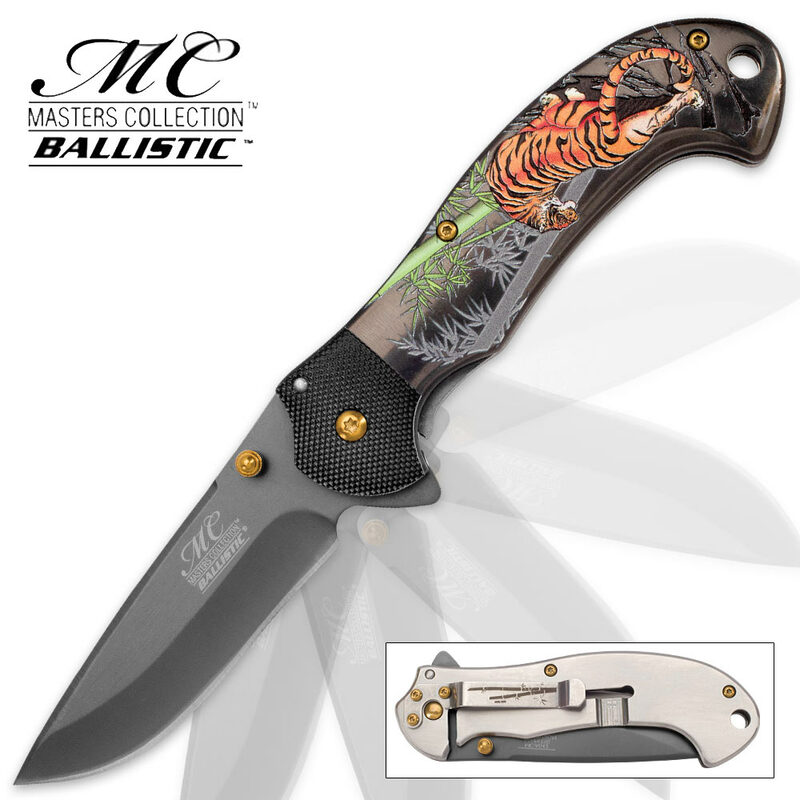 The stunning Masters Collection Wild Tiger Pocket Knife is every bit as breathtaking as the Bengal tiger and bamboo-filled jungle it depicts in radiant colored relief. Sculpted in magnificent 3-D, the titanium coated stainless steel handle portrays a stately orange striped tiger, peering back as he walks into a grove of towering, bright green bamboo. The handle's dark hue beautifully complements the carbon fiber textured bolster and gray titanium finish of the 3 1/4" drop point blade. Forged from rugged stainless steel carefully honed to a razor sharp edge, the blade deploys quickly and smoothly thanks to the assisted opening mechanism. 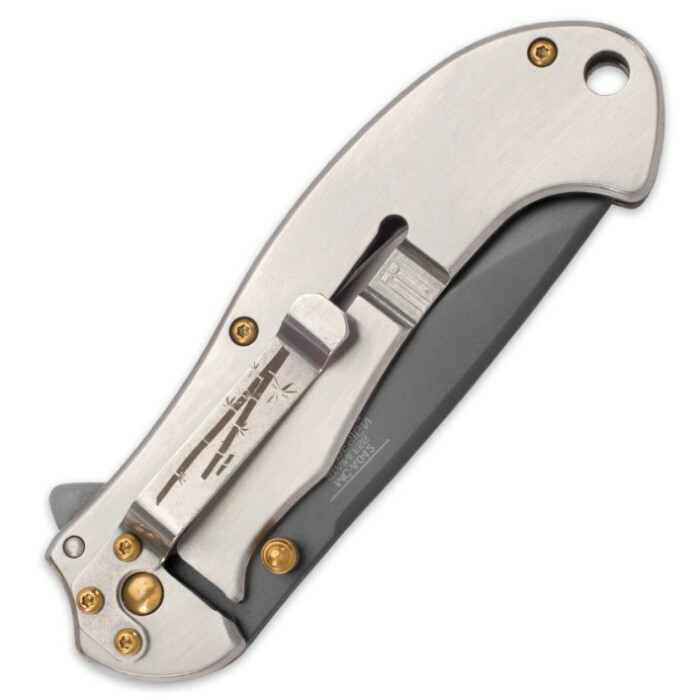 A conveniently placed flipper and golden ambidextrous thumb stud allow for easy one-handed opening, while a bamboo-etched pocket clip and handy lanyard hole make this one-of-a-kind beauty easy to transport. 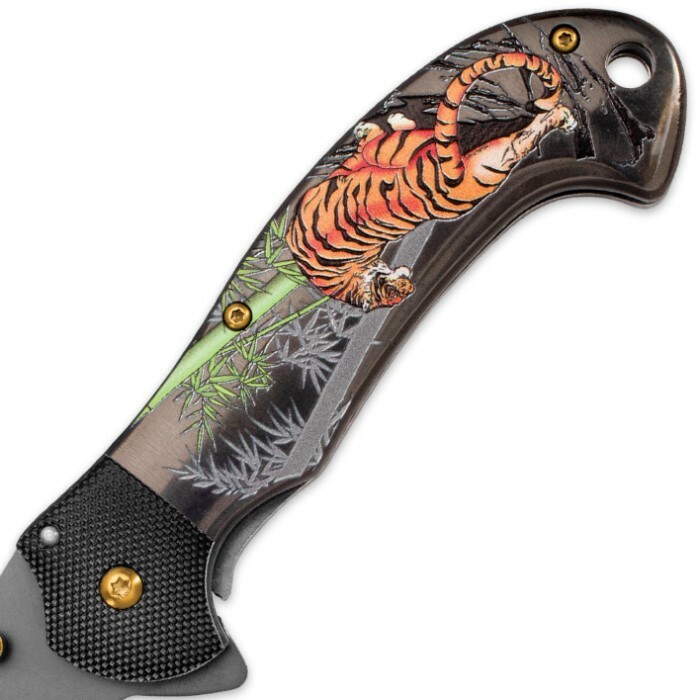 The Masters Collection Wild Tiger Assisted Opening Pocket Knife performs like a champ, whether slicing and cleaving its way through everyday cutting jobs or evoking awe and admiration in a collector’s display case.